The Waitrose & Partners Food & Drink Report 2018-19 shows how mindfulness of well-being and environment are having a huge influence on the way we shop and eat today. Released this month, the sixth annual report by the upmarket UK retailer is based on comprehensive new OnePoll consumer research of people across Britain – not just Waitrose shoppers. This work is supported by focus group research, and insight from millions of purchases in Waitrose & Partners shops and online, and from the retailer’s food and shopping experts. It was the scene that changed everything: albatross parents unwittingly feeding their chicks plastic in the final episode of BBC One’s Blue Planet II. Our research found that 88% of those who watched the programme have altered their behaviour as a result. 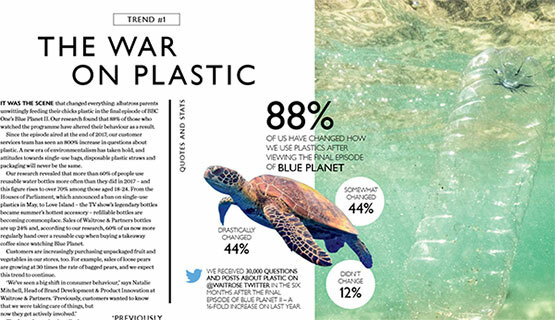 Since the episode aired at the end of 2017, our customer services team has seen an 800% increase in questions about plastic. A new era of environmentalism has taken hold, and attitudes towards single-use bags, disposable plastic straws and packaging will never be the same…..
Life is getting busier, and many people are now adopting what’s known – in a nod to the city that never sleeps – as the ‘New York day’. That is, we’re getting up earlier to make better use of our time. Six in 10 of us rise early to create some ‘me time’ or do chores. There’s been a surge in people exercising before work, and in the popularity of early-morning slots for waitrose.com deliveries. All of this extra activity at the start of the day may be due to the fact that, once we get to the office, work takes over. In our research we found nearly 70% of people feel more pressured than they did five years ago. Almost half of us are working longer hours, and 54% have less ‘me time’. This also has an impact on the rest of our day: 15% of early risers now have an extra breakfast to get through those longer mornings, while almost a third are eating dinner earlier…..
One in eight Brits – or almost 13% of the population – is now vegetarian or vegan, with a further 21% identifying as ‘flexitarian’, according to our research. This means that a third of us now have meat-free or meat-reduced diets. In many cases, these are lifestyle choices that have been adopted over the past five years, reflecting the new mindfulness with which people are living their lives. But attitudes about what it means to be vegetarian or vegan are changing, too, with some people taking an increasingly pragmatic approach…..
A faster pace of life has resulted in a change in our relationship with food. Quantity is out and quality is in. For decades ‘feeling full’ after a meal was an aspiration, particularly in the post-war years. But today, 60% of people find this attitude outdated. They don’t want to feel sluggish and would rather eat smarter to feel healthier. Views of healthy recipes on waitrose.com have risen by 158%, and visits to our online BMI calculator have increased by 104%. Meanwhile, searches for advice and products including the word ‘healthy’ have risen by 87%. ‘Customers tell us the most useful things we can do to help them with good choices are making healthy food convenient and easy, and providing recipe ideas,’ says Jane Orchard, Partner & Manager, Store Innovation….. This is but a snapshot of this delightfully creative report… you can download it for FREE here!